The Memorial Church Lower-Level renovation is located in Harvard’s Memorial Church at 1 Harvard Yard, Cambridge, MA. The original building was designed by architects Coolidge, Shipley, Bulfinch & Abbott. Built in 1932, Memorial Church was dedicated in memory of those who died in World War I, as a gift of the alumni to the University. 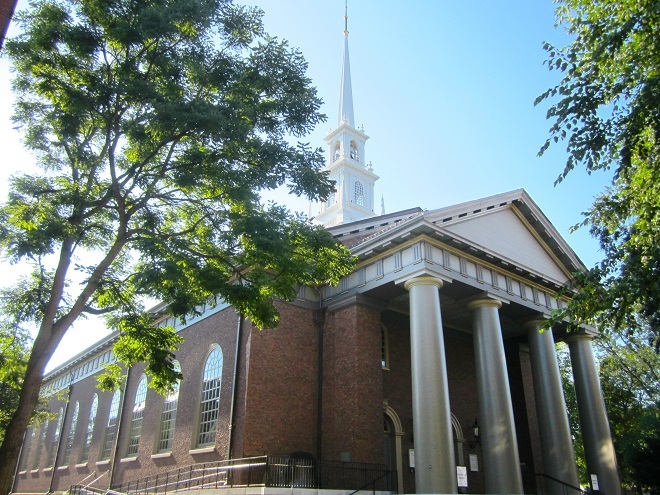 Memorial Church is part of a vibrant interfaith network of Harvard University and serves as a place of spiritual refuge to the entire Harvard community. The entire building encompasses a total of 33,171 gross square feet and the LEED project boundary consists of 11,291 gross square feet. The renovation sought to reorganize and update the lower level of the church, creating new programming spaces focused on well-being and efficiency, including a new Student Oasis, choir and meeting rooms, kitchen space, and offices. The project team was committed to sustainability from the onset and followed the Harvard Green Building Standards to make more informed decisions. These standards led to the inclusion of a number of progressive design strategies to meet aggressive energy targets and reduce water use without significant additional cost. The project achieved LEED-CI v3 Gold certification in August 2017.